Throughout the season, Inside the Hall will keep you posted on how 2011 signees Austin Etherington and Cody Zeller, IU’s eight verbal commitments and other notable prospects with interest in the Hoosiers, are performing at their respective schools. + Austin Etherington (Hamilton Heights): Nineteen points in a 88-32 win over Eastern (Greentown) on Jan. 21. Twenty-nine points and 12 rebounds in a 95-57 win over Sheridan in the Wigwam Classic at Anderson on Jan. 22. + Hanner Perea (La Porte La Lumiere): Did not play. La Lumiere returns to action on Jan. 29 against Traders Point Christian. + Kevin “Yogi” Ferrell (Park Tudor): Twenty-two points in a 77-43 win over Indianapolis Speedway on Jan. 18. + Peter Jurkin (United Faith Christian Academy, NC): Out until February with a stress fracture, according to The Charlotte Observer. + Ron Patterson (Broad Ripple): Eighteen points in a 64-46 win at Indianapolis Chatard in the City Tournament on Jan. 18. Seven points in a 50-37 quarterfinal win over Indianapolis Washington in the City Tournament on Jan. 22. Twenty-two points, including four 3-pointers, in a 66-50 semifinal win over Indianapolis Manual in the City Tournament on Jan. 22. + Gary Harris (Hamilton Southeastern): Seventeen points in a 61-58 win at Avon on Jan. 21. Four points (1-of-8 shooting) in a 63-61 loss to Westerville (OH) at Flyin’ to the Hoop in Dayton (OH) on Jan. 17. + Jeremy Hollowell (Lawrence Central): Eight points in a 55-54 loss at Bloomington North on Jan. 22. + Collin Hartman (Indianapolis Cathedral): Eleven points in a 85-31 rout of Indianapolis Marshall in the City Tournament on Jan. 18. Thirteen points in a 69-62 loss to Indianapolis Northwest in the City Tournament on Jan. 22. + Devin Davis Jr. (Warren Central): Eleven points in a 61-58 win over Terre Haute North on Jan. 21. + Basil Smotherman (Heritage Christian): Seven points in a 84-69 win over Indianapolis Howe in the City Tournament on Jan. 18. Did not play in a 87-70 win over Covenant Christian in the City Tournament on Jan. 22. Eleven points in a 94-76 loss to Indianapolis Northwest in the City Tournament semifinals on Jan. 22. + Darryl Baker (Jeffersonville): Sixteen points in a 65-56 loss at Louisville Male on Jan. 19. Thirteen points in a 94-78 win over Evansville North on Jan. 22. + Mark Williams (Cleveland Benedictine): Fifteen points in a 65-46 win over Rhodes on Jan. 22. + Zak Irvin (Hamilton Southeastern): Sixteen points in a 63-61 loss to Westerville (OH) at Flyin’ to the Hoop in Dayton (OH) on Jan. 17. Wasn’t listed among leading scorers in a 61-58 win at Avon on Jan. 21. + James Blackmon Jr. (Ft. Wayne Luers): Twenty-nine points, including six 3-pointers, in a 74-64 win at Harding on Jan. 21. + Trey Lyles (Indianapolis Tech): Sixteen points and eight rebounds in a 62-52 loss to Indianapolis Northwest in the City Tournament on Jan. 18. + Ernie Duncan (Evansville Harrison): Seventeen points and six rebounds in a 58-57 loss at Evansville Bosse on Jan. 18. Harrison fell 67-47 at Boonville on Jan. 22, but no individual stats for Duncan were reported. + Jaraan Lands (Brownsburg): Fourteen points in a 54-44 win over McCutcheon on Jan. 21. + P.J. 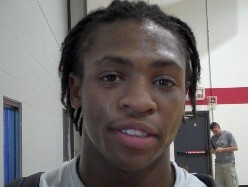 Thompson (Brebeuf Jesuit): Twelve points in a 54-43 win over Guerin Catholic on Jan. 21. + Trevon Bluiett (Park Tudor): Nineteen points in a 77-43 win over Speedway on Jan. 18. Thank God for these recruits because our current team is playing really bad basketball now. I’ll take Zeller, Yogi and Jurgen right now! Hell I’d probably take Lyles and Blackmon as well. Good Timing – It is nice to read about our recruits after another thrashing- there is a future! Jurkin is hurt. I would take CZ, AE and Patterson. All 3 can score. All 3 can play more than one position and all 3 are leaders! Hard not to take Yogi with our current PG situation. Here’s a thought. Bluett keeps putting up good numbers and I’m starting to think that it’s in part to playing with Yogi. He just seems to be the type PG who makes the other players better. And it just amazes me that Lyles and Blackmon continue to put up the numbers they are getting night in and night out! Lyles really, really needs to transfer to a basketball school where he can get some guys around him and work on his distribution because it appears he is pretty much it at Arlington. Blackmon’s team is pretty good and he STILL puts up huge numbers as a freshman so they must really look to him! I’m still anticipating these two being the best 1-2 punch IU has had since maybe Wilkerson/May! Man AE continues to put up surprisingly good numbers (or at least surprising to me). Same goes for Patterson. In 2-3 years we’re going to have practically a full roster of 6’5 guys that can shoot and drive with success. And those freshman? Wow. We all know how good Lyles has been and the stats he’s put up by himself on that team. And I know Blackmon is highly rated and all. But for a freshman guard to be putting up 20+ points consistently is pretty amazing. I’m really look forward to being an IU fan in a few years b/c as a fanbase we are going through plenty of hardship to really “earn” a successful team. Bragging and trash-talking are so much sweeter when you’ve gone through the dumps to get there. I wouldn’t say that FT Wayne Luers aren’t a basketball school, they won State a year or two back, and are currently #3 behind our local school. As I recall when we played against them a couple years ago, they were pretty loaded. Of course that would have been with Deshaun Thomas, but….around here size and talent aren’t really known to be lacking down there. Keep in mind AE’s relatively weak schedule in high school where he shines in his conference. That being said, I saw him play in the super pool with Indiana Elite at the Adidas Invitational last summer. I saw Elite play a team from L.A. and NYC. Cody got in foul trouble against NYC and AE started going to the hole. This kid is tough and he earned a lot of respect in my eyes. He can play at the next level and he has the growl. Patterson is beginning to become my favorite after seeing him three times this year. He locked down Yogi in the second half in the Indy Metro League Championships in Noblesville last fall. I saw him stroke 25 points, a majority being 3’s against Cathedral in a loss. He had to have shot well over 50% from the arch. Then I saw his complete game against Jeffersonville at Mackey, where he had like 15 points, 7 boards, 5 blocks, 5 assist and 4 steals. I sense some leadership skills are developing in his game as well. He communicates on the court or at least he did against Jeffersonville. Scoot Hicks is developing this kid nicely. Aceman was refering to Tech high school where Lyles goes. Ft. Wayne Luers though, is a good basketball school. Updated scoring averages for games reported by ITH from Nov 28th through today. Keep in mind the incomplete nature of the data. But for some kids this probably is very close to their true output. Good stuff, Dave. Thanks for putting this together. We haven’t missed a ton of games, so this should at least be fairly accurate. As the official facebook stalker of ITH, I will tell you that it’s Ron Patterson’s birthday today. Better to do something like this than to write some spleen venting piece over the drek witnessed yesterday. I’ll be able to update it weekly or maybe biweekly now that its started. That’s fine, just tired of seeing our undersized guards get man-handled in the Big 10. Buss can handle the point in the dribble drive. Though I do think Yogi can get to the rim and dish at the least. We could have used AE last night when we were cold from 3. Could have used Cody in the paint. AE is a very solid all-around player. Many of us love the athleticsm of VO and WS, but AE will be arriving on campus this summer with a more complete game than WS and VO. Not saying AE is the best ever, just better at shooting, passing, facilitating and looking for the open man, and a bit more of a floor general. He has a very high basketball IQ. WS seems to score on dunks or when he is found in the O. VO seems to be able to penetrate and get to the hole. AE does the same thing but has very good touch from 3 or mid-range. Glad you saw AE play in the summer. He is better there than in high school. Keep in mind that he plays for a very poor high school coach who doesn’t run plays to AE. Whatever AE gets he earns, no special wrinkles or plays run to free him open for a shot. I say it every time but I’m tellin you Blackmon is the REAL deal. Maybe in the long run it was a good thing that B.J. Young decided to sign with Arkansas. This is the second time this school year that he has been kicked out of a game. Let’s do it like the NBA. If they look good as freshmen they can be a 1 and done and move them on up to college ball. We could be loaded next year. Actually Will is 50% from 3 point range. Ten attempts is not a big number but if he can stay near there and add a nice shot fake to his driving ability…… It would be fun to watch. I know this sounds bad, which is fine because as you know I am a very bad person, but this weekly update on our recruits far outweighs my interest for the current Hoosier situation. I jtust reeks of disaster. These guys will all help immediately. A big plus IMO is Will and VO and how they will fit in nicely moving forward. I would take these two kids into battle every day. The rest of the season will be very interesting. I think it may get uglier before it shows promise. Thanks for all the additional info. I love the fact that the ITH readers are essentially out there scouting our future players closely. Few if any other basketball programs have this sort of following. My co-worker here in Boston is an OSU alum and is always jealous of all the info I get from ITH. Yeah, I was saying that Lyles at Tech isn’t a good fit. Luers is a good sports school all-around and Blackmon is going to play with other good players. I’m just worried that Lyles isn’t going to get that same opportunity at Tech. Yeah, it’s pretty much a given that we could have used Cody every game this year! He would already be a significant post upgrade to the options now but I also think he’s going to make TP a lot better. What else are we going to do this year? Ouch! Illinois is ripe for the getting cause their heads have to be swollen after a couple big wins “at home”! We’ll have to really, really turn things around again though! For Christ sake man give us a break and let us think about something positive. A very bad person, a hilarious person, a doom-and-gloom person . . . Which is it? I’m getting so confused . . .
Luv ya, MillaRed! Go Hoosiers (towards the promise)! Don’t over-analyze Lyles at Tech. And, if he transfers, will the IHSAA nail him? Very true. I saw AE two summers ago shooting before an AAU game and thought the same things. When he shoots, the ball doesn’t rattle around the rim, it either glides through the net with no rim, or it kicks down off the back of the iron, straight through the net. I would really like to see him get 4 or 5 3’s a game next year to get him confidence as a FR so he can be our Diebler as a So, Jr, and Sr.
Sure would be nice to see. I think WS has the potential to really become a strong perimeter shooter. If he could just shoot 2 or 3 3’s a game, that would open up his driving game too. Give me Hulls, AE, WS, Mo, and CW shooting 40% next year and we WILL beat some good teams. The Sporting News ranked AE as the #2 shooter in the class of 2011…..for the entire nation. Give him a summer and fall in Cook Hall and he can be an assassin immediately as a FR. If Mo is not back next season, I would like to see a taller AE get his shots from 3 land. AE will also feed the post, something our guards don’t like to do so well right now. Get some more inside out going with CW and CZ and AE and Hulls should get some good looks from deep. Glad to see we do not have that headache! We cannot fault CTC’s recruitment of high character guys. That is something I am proud of. Hopefully the x’s and o’s improve as the talent level of the program improves. it’s impossible to pull for Coach Crean and criticize him at the same time. Some people don’t want to hear it because they too are frustrated. Personally I thought these type of games were a thing of the past. who the H really knows what we’re gonna do any more? We all love the Hoosiers. I don’t need anyone to tell me I feel differently. Thx for the note ITM. Just curious is AE a lefty? So true. All you can be sure of at this point is that you can’t be sure of anything. Will they come out and play great against Illinois or lay an egg and get pummeled? Who knows? If anyone knows that they could make some real money in Vegas because I’m sure they are stumped as well. We are consistently inconsistent from game to game. We jump from terrible to decent back to terrible to above average to improving back to horrendous from game to game to game. Go Hoosiers bring out the Above average to pretty good game on Thursday against the Illini. I hate them as a program. They have the same names as we do for both their Basketball and Football facilities and it angers me. We need a quality win out of nowhere and our team is just crazy enough to pull it off. Our Hoosiers are starting to remind me of most of the women I’ve known in my life. Hot one minute and cold the next, happy one minute and sad the next for no apparent rhyme or reason. Just when you think that they’ve figured themselves out and you have also figured them out they go and pull something like on Sunday and you are just as confused as you always were. vs Illinios. We can use the money to throw a party in Alex’s backyard. National Championship game 3 times.